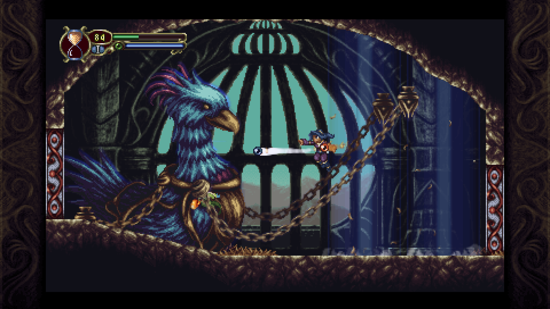 Timespinner is a beautifully crafted story-driven adventure, and an ode to classic 90s action platformers. Follow Lunais, a head-strong young timekeeper, on her quest for revenge against the empire that killed her family. Use time-bending powers to explore a vast, connected world, and change fate itself. Timespinner is available now on Steam, Humble and the PlayStation Store. It might sound crazy, but development really started on Timespinner back when pixel artist, programmer, and designer Bodie Lee was still in grade school! Inspired by his love of the Castlevania series and Mega Man X, Bodie started crafting the game world of Timespinner, making fabric figures of each character and cataloguing their adventures and storyline in notebooks. It wasn’t until high school when Bodie could start turning this fantasy world into a reality, making several prototypes of the same game world using RPGMaker2000 and later turning it into a full game prototype for a programming class in college in 2008. After graduating college, Bodie went on to work at Microsoft Game Studios and later Bungie, during which time he started refining his prototype into a full game with every free evening and weekend. After 4 years of working in AAA games, Bodie decided to leave to start work on Timepsinner full-time, living off his life savings, and determined to finish his dream project. Inspired by successful Kickstarted indie projects at the time, Bodie set up a crowd-fund for the project in June 2014, and in a month alone successfully raised $176,667 (over 300% of his goal!) to complete Timespinner, with the help of 5,751 backers. The game is now available on PC, PS4 and PS Vita.